A customized 4.5 x 5.25 magnet is value effective and it may serve you longer than a promotional product or a paper card of the same size. Actually, you are not paying for the advertising space alone, but also for the long-term exposure and improved relationship experiences that accompany these personalized magnets. There are always hushed fears, whether people would ignore information thinking it a farce or Whether people would avoid customized magnets altogether or whether they would trash it the moment they receive it. Although many advertisers have already adopted magnet advertising, but they largely avoid it for the reason that their magnets may not make an impact. However, 4.5 x 5.25 is one of the larger sizes and people may not ignore it altogether. At least they would take pains to retain it over their refrigerator door because full color magnets are attractive and make great refrigerator art. During all these years, you might have worked over different advertising platforms. Your experiences may vary largely across all these platforms. Being creative to the core is the first and the only requirement of a marketer like you. Perhaps you want to present your brand information in a very appealing and attractive way. You do not want to compromise with quality and quantity of information. There might be times, when your well-crafted or well-planned strategy may never take off. Do you know why? Because they all sounded like a deadpan with no emotions. The reason – you have tried to save on creativity with the fear of overdoing the budget. You can get out of such cliché by investing in an advertising magnet 5.25 x 4.25 because it lends you big room for creativity. You don’t have to worry about the choice of colors, only you have to identify and customize the information that you want to share with the crowd. Best pricing becomes a rarity, if you are considering high quality corporate gifts or individual gifts. You can easily get rid of this limitation by purchasing high quality 5.25x 4.25 magnets from any ecommerce store stocking only made in USA magnets. They offer you benefits of best buy pricing on bulk ordering and allow you to save on online design proof, art setup, shipping, and full color printing because their prices are included. We have a reason to say that you are going to enjoy one of the best personalization experiences of your life because you are saving on efforts. Got puzzled? 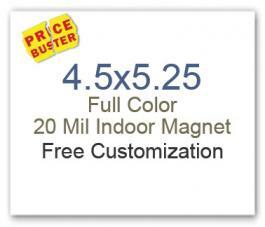 Yes, on purchasing from an online store stocking custom magnets (made in USA), you can expect to save on efforts. Most of such online stores offer you help from the scratch. Only you need to share your artwork with them in their specified format and sit back to see your ideas materializing. This blog only suggests experiences you may enjoy while working with 4.25 x5.25 magnets, however your experiences would be brilliant after you gift them during the next available opportunity.